A model of a round polished body with a diameter of 45 mm and 10 mm thick made of Damascus steel. Water Resistant – 100 meters. 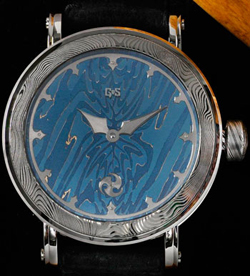 The original dial is also hand-forged Damascus steel, its periphery is a ring with indexes, which, like arrows, hand made of polished white gold. Protects original dial flat sapphire crystal with anti-reflective coating. Screw-back case is also closed flat sapphire crystal, you can monitor the work of Swiss movement with manual winding ETA 6498, which was trimmed and adjusted to the Swiss brand Soprod chronometric precision of the bridges of Damascus steel. The novelty of the Winter Gustafsson & Sjogren adds black leather strap with stainless steel buckle. Watch or Nano iPod? All at once!